Ledger scares the lines right out of Caine’s brain! Michael Caine, who plays Bruce Wayne’s trusted butler, confidante and father figure, Alfred Pennyworth, recently spoke about acting with Heath Ledger’s Joker in the currently filming Batman Begins sequel, The Dark Knight. Heath Ledger’s Joker will scare you, too, on July 18, 2008. I think they had the right idea. While Nicholson was a psychopath, he really didn’t have that edge to him. He was maybe more calculated than the Joker of the comics? I know he did some kind of random things, but Joker has little rhyme, little reason, he is insane, and that is really the best way to describe it. Jack may have been insane for the late 80’s, but to be scary today and really convey a level of horror, you have to take it up a notch in today’s cinema. I have to agree, when Serial Killers are even popularized in television (Showtime’s “Dexter”) you seriously have to amp up on your levels of insanity for people to take it seriously. Excellent points, both of you! The Joker needs to be terrifying and random and scary beyond reason. Even the original Batman comics got that right. 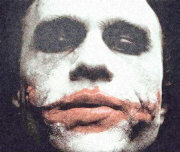 I honestly think Heath Ledger’s going to give us all nightmares. I think I said it the first time you posted a pic of Heath’s joker…this picture is freaking me out. Hi John, where have you been? And how have you been? Well enough of that….I haven’t seen too many clips of Ledger as the Joker and one picture does not a Joker make. I’m not going to say much about Nicholson’s portrayal of the Joker, I don’t feel I have to, and we both know that Heath will be judged against Jack’s performance, so let’s hope that if they are going for a more comic edged Joker that Heath’s done his homework. But I have to admit, it can’t be all bad if Michael Caine says he was scared of Ledger’s performance as the Joker, and Heath made him forget his lines. I’ve been around. And I’m doing well. How are you? It’s always good to see you around here, and I always appreciate your viewpoints. Thanks again for stopping by. I think they’re on the right track by going an entirely different route from what Jack Nicholson did because, as you’ve said before, Jack’s Joker is unstoppable. Heath’s Joker, I think, will be more like the random but brilliant psycho from the comics. Can’t wait to talk about the movie with you after it’s out, which thankfully gets a little bit closer every day.